Chor der Oper Zürich, Philharmonia Zürich / Gianandrea Noseda. Opernhaus Zürich, Zürich, Switzerland. Sunday, May 14th, 2017. 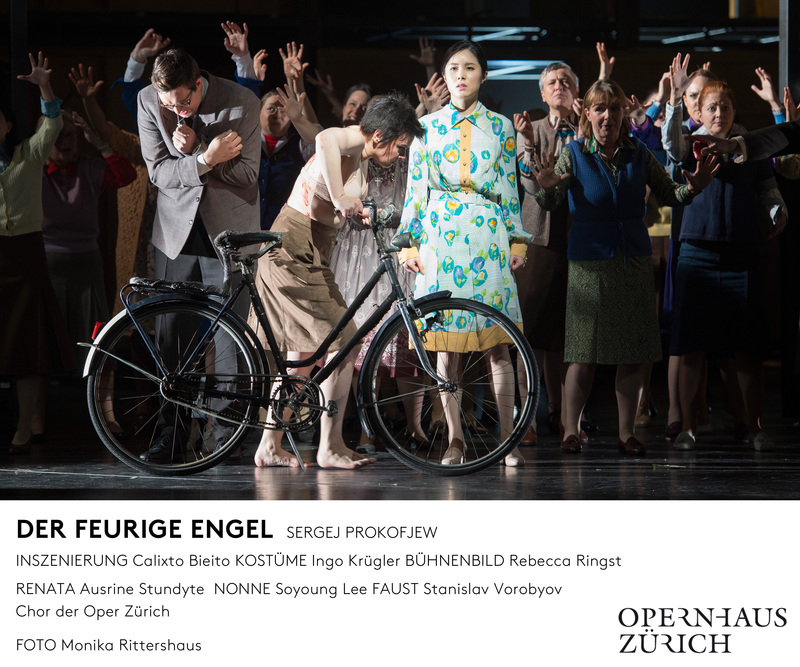 Opportunities to see The Fiery Angel on stage aren’t quite as infrequent as last night’s The Fair at Sorochyntsi but it still is a piece that is very much a rarity, due to the large orchestration and exceptionally demanding soprano role. 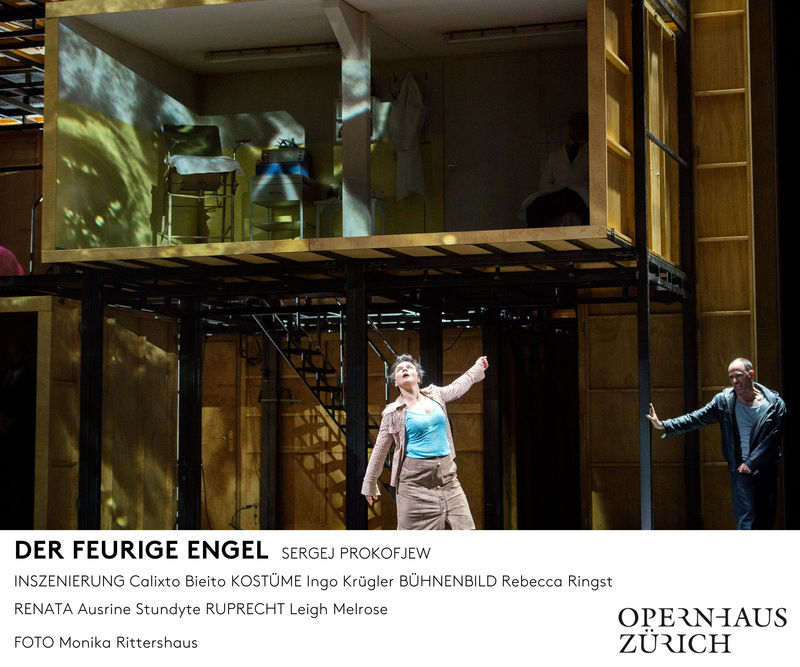 My only other previous occasion to see it in the theatre was Barrie Kosky’s high-camp Munich production (incidentally also with sets by Rebecca Ringst) and today’s Bieito staging could not have been more different. 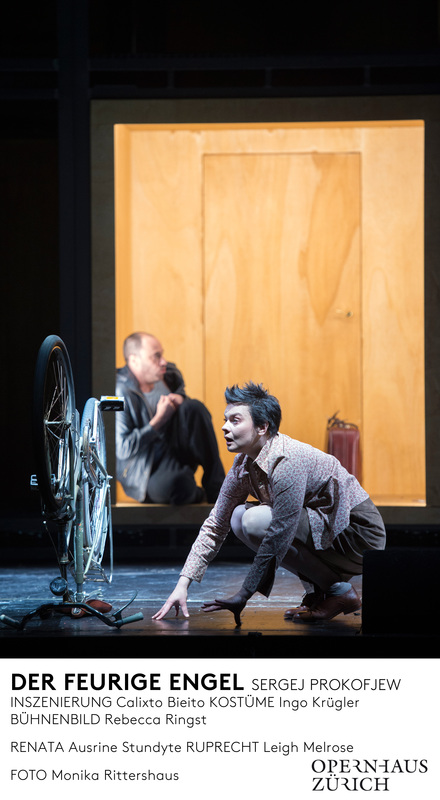 Inevitably perhaps, Bieito’s view of the work was much darker than Kosky’s – no tattooed male dancers in ballroom gowns here – yet as always with the visionary Catalan director, his vision was very much based in the text. Indeed, it struck me that we were witnessing the kind of performance that united the text, the colours in the score and the visuals to create a total work of art – the kind of evening in the theatre that happens all too rarely. Bieito takes as his starting point the fact that Renata is recovering from trauma. As she describes how the Fiery Angel visited her one starts to gain the impression that she is in fact a survivor of abuse and her experiences have very much formed who she is today – nervous, broken and scared. Bieito never shows us Renata’s abuse (although he comes close in the final scene as she is exorcised) but that idea is very much there in the text. 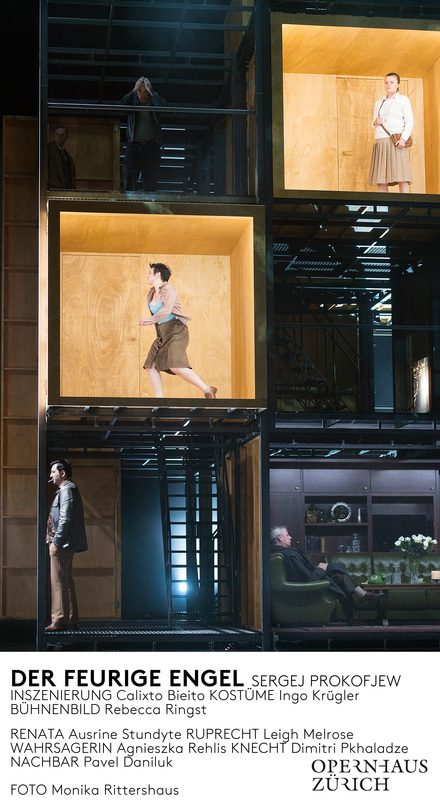 The set is a revolving cube, revealing suburban living rooms where people live lives of quite boring mundaneness. Renata appears to us outside of the block, incapable of living within the society yet, as her face is projected onto the structure, is also a product of it. As the performance progresses, we become aware of women trapped in rooms or being made to stand on tables to be watched. Everything is intimated, nothing is confirmed and our unwillingness to confront and ask questions makes us as spectators very much complicit in what happened to Renata and to the other women. Bieito holds up a mirror to society and makes us ask ourselves what we would really do in a situation where we suspect abuse. In the Agrippa scene, he is portrayed as an abortion doctor and we see him simulating the procedure on an anonymous woman. Bieito seems to me to be saying that this is just one result of abuse – there is no judgment – yet the scene was instantly booed by a lone voice. Of course, it’s impossible to know whether the person who booed might have been a survivor and this could have been most traumatic to watch. Yet it also struck me that in having that visceral and immediate reaction the booer, instead of reflecting with compassion on the fate of that woman, could in fact have been quite complicit with Bieito’s view of society and the way it treats those recovering from trauma. Of course, one could say that themes like this aren’t meant for entertainment and they most certainly aren’t. And yet, if theatre does not engage with and make us ask questions of ourselves, what is it there for? In a fascinating interview published in the extensive program book, Bieito stated that he wanted the audience to feel with Renata. He also mentioned how much he appreciates working with singing-actors of the calibre of Ausrine Stundyte and Leigh Melrose. Both were absolutely tireless despite being on stage constantly through the two-hour intermission-free evening, giving us visceral and uncompromising performances of exceptional power. Renata is an ideal role for Stundyte. Her dusky soprano rode the super-sized band with ease and there was never any sense of the role taking her beyond her limits. Indeed, her ecstatic cries of Madiel in Act 3 were dispatched with tremendous abandon. Her physicality was absolutely tireless – constantly moving on stage – and her exorcism was harrowing to watch as she was thrown around by the nuns. Stundyte is without doubt one of the leading singing-actors of our time, her uncompromising dedication to her art and bringing a character to life is astounding. Melrose was a more lyrical Ruprecht than we might be used to. His baritone has a touch of dryness but he always sang within his limits and thanks to the intimate size of the theatre certainly pulled it off. As with Stundyte, he was also physically indefatigable. The remainder of the cast reflected the exceptionally high standards of the house without a single weak link throughout the entire cast. Pavel Danliuk boomed magnificently as the Inquistor with a voice of wonderful evenness. Liliana Nikiteanu sang her music in an extrovert mezzo with real character. Agnieszka Rehlis likewise dispatched her roles with a bright, soprano-ish mezzo with good sheen. Dmitry Golovnin’s well-placed tenor had real cutting power as Agrippa and Iain Milne’s plangent, more lyrical tenor was also an asset to the cast. Andrzej Filónczyk made an impression with a very handsome baritone. The house chorus was absolutely sensational. It’s hard to imagine the work better sung. Their pitching was staggeringly accurate and the way that every single member of the group incarnated a completely different character was outstanding. Gianandrea Noseda very much brought out the moonlit colours in the score, at one with the stage pictures. Strings varied from jabbing to silky smooth with the various instrumental parts ideally voiced. His pacing felt absolutely right pulling out the motoric, pulsating rhythms in the score as well bringing out its strangeness where necessary. The quality of the playing of the Philharmonia Zürich was absolutely exceptional. As the work came to a close with suburban housewives performing an exorcism, one could question what was being exorcized – Renata’s memories or society’s guilt for allowing it, whatever it might have been, to happen. Bieito in a way gives us an important message to leave with – we can make a difference and we can make lives better but we have to be open and compassionate to others. This was intelligent and vital music-theatre – both musically and dramatically at the very highest level – it made us feel and it made us reflect and it also highlighted the work of some exceptional singing-actors.